Parents of babies with reflux know all too well how tiring the search for the right formula can be. With so many options, and grand claims by manufacturers, we’ve decided to formulate a list of the five best formulas for babies with reflux, and save you some time and frustration. Nutramigen formula is hypoallergenic, meaning its proteins are broken down more extensively than the partially-hydrolyzed options. As mentioned earlier, in order for a brand to stamp “hypoallergenic” across its baby formula, it must first be passed through extensive testing to prove itself worthy of such a claim. This formula contains all of the regular nutrients of most baby formulas, but is also suitable for lactose intolerance. This makes for a great addition to the usual gentle formula, as it can reduce or alleviate any symptoms caused by lactose-intolerance or an allergy to milk proteins. The fact that this formula is created with extensively hydrolyzed proteins, its taste may vary quite a bit from what your baby is used to. So, if your little one is a picky eater, it may be an issue, or something that could take some time to get used to. It is also worth noting that some insurance companies will pay for baby formula, if it is considered a medical necessity. Enfamil has created a form, which can be found on their website, for you to bring to your pediatrician to fill out, and then send to your insurance provider to ask for reimbursement. Enfamil is a widely-known brand in baby formulas. They offer many formulas for a wide variety of needs, two of which I have recommended here. The first is Gentlease. It’s a milk-based formula, although it is partially-hydrolyzed, meaning the milk proteins have been slightly broken down for easier digestion. Gerber is one of the top brands in infant formulas. Their Good Start line of products has a long list of options. I’ve chosen their Gentle formula as a recommendation due to the wider range of issues it can alleviate. As a side note, they do have two other products related to children with digestion issues: Gerber Good Start Gentle for Supplementing Breastfeeding, and Gerber Good Start Soothe. All three of these formulas are Non-GMO, meaning they contain no genetically modified ingredients, so if this is a particularly important factor to you and your family, Gerber Good Start Gentle could be a viable option. Another great thing about the Gerber Good Start product line is that they offer a money back guarantee, for any single unit. So if you decide to give any of their formulas a shot, and find that it ends up not being the best option for your child's particular needs, you can contact Gerber, and they will issue you a refund! Similac Sensitive is another partially-hydrolyzed formula. It contains a specific blend of nutrients called “OptiGro” for healthy growth and brain function. One very important aspect to note is that Similac Sensitive contains nucleotides. Breast milk is usually very high in nucleotides, and studies have shown the essential role they provide in the growth and development of infants. Parent’s Choice is another widely-known manufacturer of infant formulas. Their Gentle formula is, once again, partially-hydrolyzed, as well as Certified Kosher. The addition of prebiotics makes for an especially well rounded nutrient profile, which can aid in the production of intestinal bacteria which can promote healthy digestion. However, the lack of ingredient information on their website is both uncommon and seems a bit misleading, as the ingredients are the most important factor when it comes to formulas for infants with reflux. With so many options in today’s market, the search for the right formula can be exhausting. Parents are faced with the daunting task of choosing between hypoallergenic and “gentle,” non-dairy and low-iron, brand name and generic, and the list goes on. Other options include medical intervention, with tests, procedures, and medications, as well as active engagement from parents, like changing feeding habits, schedules, and positioning. We all know brands can be deceiving in their claims, and advice from doctors, friends, and strangers on the internet can be conflicting, adding to the frustration of it all. To help ease some stress, we’ve boiled down that list to the key factors, and described what each one really means below. 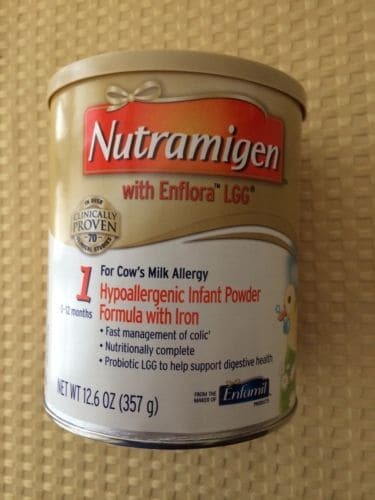 Hypoallergenic formulas are created for infants whose bodies have negative or allergic reactions to certain food proteins, often a cow’s milk protein allergy. In order to claim hypoallergenic properties, formulas must undergo extensive pre-clinical and clinical trials, ensuring that the formula does not induce symptoms in 90% of infants in the study (Source). Your child should react positively to these formulas if the main cause of their reflux symptoms is a protein allergy. A common belief exists that iron in formulas can cause digestion issues in infants. However, according to the American Academy of Pediatrics, the level of iron in baby formulas can be a major factor in determining whether or not a child is more prone to iron deficiencies as they continue to grow. Iron deficiency can cause many problems later in life, including anemia. If nothing else is working for your child, ask your doctor if these formulas would be worth a try. But otherwise, we recommend steering clear, as studies have been showing the major negative effects of these products for several decades. Although somewhat controversial, other options do exist for babies with Gastroesophageal Reflux. Medical procedures to determine the root cause of discomfort are often, ironically, uncomfortable themselves. Many of these interventions are invasive as well as expensive. Medications may help certain infants, but many of these can be dangerous, and can cause a long list of side effects and other problems. 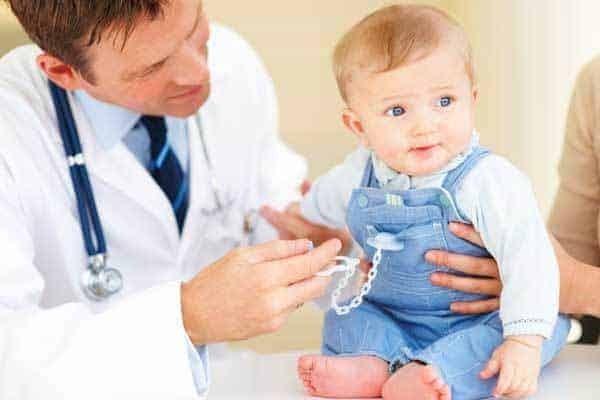 Studies have provided conflicting results as to whether or not medications even help in aiding reflux symptoms in infants. Except in extreme cases, it is recommended to try other alternatives before taking this step, as most cases of reflux in infants dissipate on their own over time, as the child grows past infancy. Aside from choosing the right formula, it is equally important to employ other strategies to help ease your baby’s symptoms. There are many helpful sources to explore when seeking new ways to help with infant reflux. Keeping them in an upright position during feeding and for 20-30 minutes after is widely recommended. Feeding your infant smaller meals more frequently can help too, or with a doctor’s approval, thickening your baby’s formula with certain cereals can sometimes cause less irritation during the digestion process. This video demonstrates some important steps in helping your baby feel better during and after feeding. Although you may have to try several formulas until you find the right one for your child, it is clear which formula has the best profile for infants with reflux. Nutramigen ﻿﻿with ﻿﻿Enflora LGG is certified hypoallergenic, meaning it has gone through extensive testing, and the proteins are fully broken down for the easiest digestion. With its long list of added benefits, Nutramigen with Enflora LGG will give your child all the necessary building blocks for healthy growth. Combined with healthy habits for babies with reflux, this formula can alleviate some or all of your infant’s spitting up, discomfort, and fuss… and a happy baby is a happy home!